Wild horses photographed in southwest Wyoming, site of a recent BLM helicopter roundup that saw 1,968 wild horses captured. RTF file photo by Steve Paige. 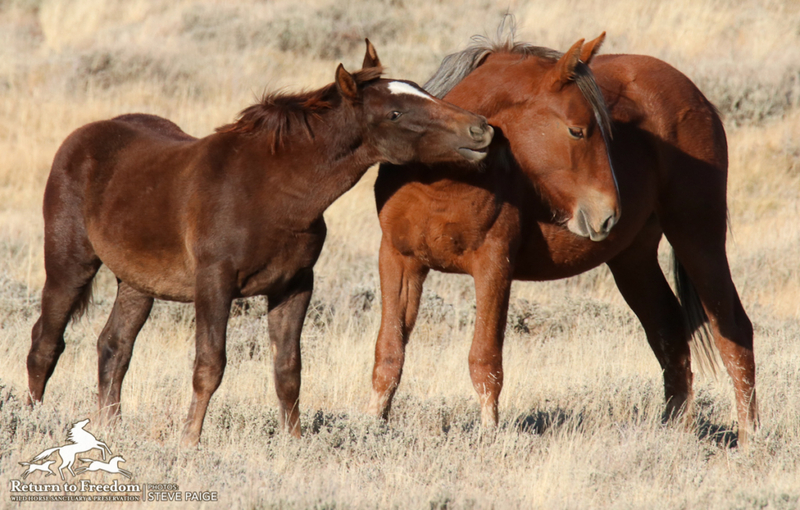 Note: A broad spectrum of wild horse and animal-welfare organizations support the judicious use of fertility control as a safe, proven and humane solution that would enable the Bureau of Land Management to manage wild horses and burros on the range. Return to Freedom, which has used PZP with 91-98% efficacy rate at its sanctuary for 19 years, views the use of fertility control as one of several solutions that taken together could provide wild horses and burros with a sustainable future on the range, where they belong. Unfortunately, BLM has never spent as much as 4% of its annual Wild Horse & Burro Program budget on the use of fertility control. For myths and facts on PZP, click here. To learn more about humane solutions and sign RTF’s Wild on the Range petition, please click here. The Senate Appropriations Committee will soon consider its version of the budget. 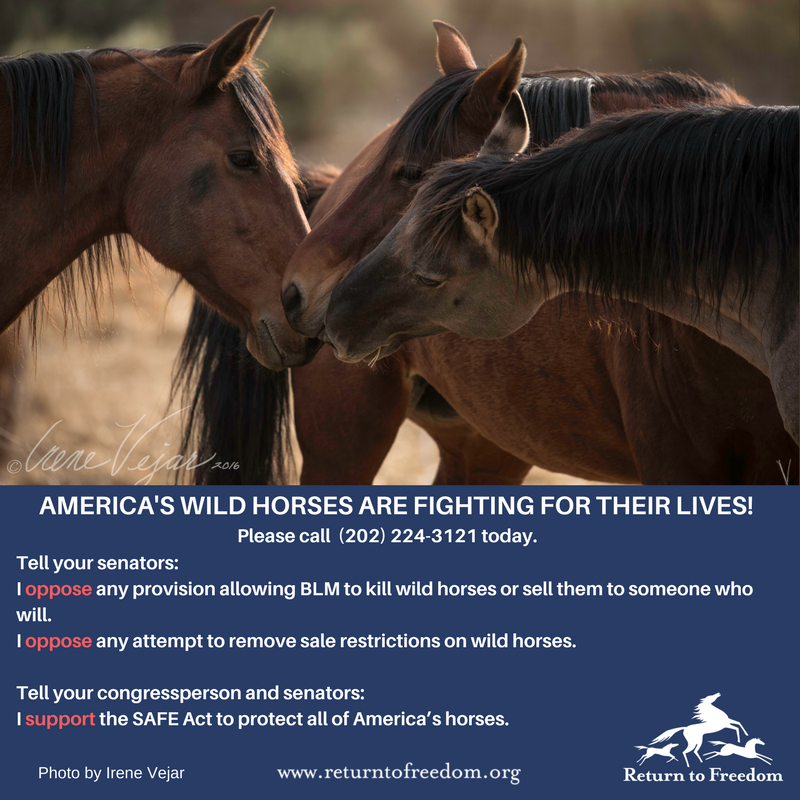 Some advocacy groups, like Return to Freedom, have said they “do not believe that the bill will include language that will allow [Bureau of Land Management] to ’euthanize’—kill—healthy, unadopted wild horses and burros.” But they’re not taking chances, urging members to call their senators. The BLM oversees the Wild Horse and Burro Program, established in 1971 with the goal of managing wild horse populations and protecting the animals from ordinary citizens who had for years rounded them up and sold them to slaughter. Of course, the BLM rounds up horses, too. As of August 2017, the agency was keeping around 44,500 horses and burros in off-range pastures. Some of these pastures are located on private land. A per-horse fee is paid to land owners whose acreage is used to house horses and burros. According to March 2017 estimates from the agency, another roughly 60,000 horses and 13,000 burros live on rangelands in 10 states in the West. Of the wild horses roaming free, more than half are in Nevada. But the BLM doesn’t sell horses to slaughter, because the Act protects them from it. And since 1997, when the Los Angeles Times broke the story that 90 percent of horses adopted out by the BLM had been sold to slaughter by their supposed adopters, the agency has increased the stringency of the adoption process that allows citizens to take in wild horses removed from the range. Some horse advocates have claimed on social media that the Appropriations Committee changes would lead to horse slaughter on a massive scale—and many thousands of horses could, in fact, be put down both on the range and in BLM corrals and pastures. But the changes made by the committee would not permit horses to be sold to slaughter. Wild horses might be euthanized, but their meat wouldn’t go toward feeding hungry people, anywhere. According to Amodei, euthanasia in large numbers may not need to happen either. The Reno Gazette-Journal reported that during an Aug. 21 interview with its editorial board, Amodei said his support of the amendment was meant to put pressure on horse advocacy groups that are opposed to programs which administer birth control to horses living on the range. “If we really don’t want to kill ’em—which, by the way, I agree with—then we need to get seriously behind this whole birth control thing, so we can reduce those reproduction rates so they are in line with something the ecosystem can support,” he told the RG-J. New York-based Friends of Animals and San Francisco-based Protect Mustangs are two advocacy groups that oppose birth control for wild horses. The groups say recent studies show use of the contraceptive Porcine Zona Pellucida (PZP)—which is used on various animals in zoos the world over and can keep a wild mare from reproducing for up to two years—has unnatural impacts on mares and their herds. They’ve filed multiple lawsuits to halt experimental programs in which the BLM and private citizens dose wild mares with the contraceptive using dart guns. One such program in Nevada was stalled by lawsuits from Friends of Animals. Pine Nut Wild Horse Advocates—a non-profit staffed by volunteers—began darting mares in an area near Gardnerville with PZP in 2012. In 2014, with the blessing of the Wild Horse and Burro Program’s Nevada office, they established a pilot program to control the population of wild horses near the Pine Nut Mountains. The Pine Nut group’s members use donated funds to pay for PZP training and certification from another nonprofit, the Science and Conservation Center in Billings, Montana. They also use fundraising to pay for the vaccines, which according to SCC president Deb Walker, cost about $25 per dose. So, the program was established at no cost to the BLM—or taxpayers. It’s been nearly two years since the Pine Nut group darted a mare. The contraceptives they administered to dozens of mares will have worn off by now. But they may soon get a chance to begin their efforts anew. According to John Axtell, wild horse and burro specialist with the BLM’s Nevada office, the agency is finishing an environmental assessment that, once signed, will clear the way for darting to resume. “It will likely be signed in November, at which time the volunteers can once again dart the mares with PZP contraceptives,” Axtell said in a recent email interview. According to Axtell, “because of the amount of litigation involving EAs relating to the [Wild Horse and Burro] Program and PZP in particular, there has been extra review involved.” And this combined with the year’s exceptional fire season, he said, has slowed the process down. In the meantime, the Pine Nut group has been in contact with Rep. Amodei. Its members want him to do something about the way the Environmental Protection Agency classifies the drug. PZP is registered as a pesticide with the EPA because the agency has no other, more appropriate classifications for it. While the group waits to begin darting again—and horse advocacy groups wait to see what the Senate Appropriations Committee bill will hold for mustangs—the National Wild Horse and Burro Advisory Board recently adjourned from its meeting in Grand Junction, Colorado. The board is independent and creates a yearly set of recommendations to the BLM for managing horses and burros. This year, as in 2016, it recommended the BLM include lethal options for managing horse populations on and off the range. The BLM hasn’t indicated that its position has changed; however, webpages containing statements about the agency’s no-kill policy for healthy animals have been removed from the BLM website.